1. The game is played by 2 players. 2. The turns in the game between the players are based on words from the word pairs, middle words combined with hand gestures and glances. 3. In order to pass to the other word pair, the player has to use a middle word with its corresponding gesture. This obliges the other player in turn to change hir glance. 4. The objective is to navigate through the 4 phases of the game by luring the other player as deep as possible into the virtual side of reality. By trying to confuse and deceive one another, the rules of the game are in a risk of falling apart, transforming into something else. 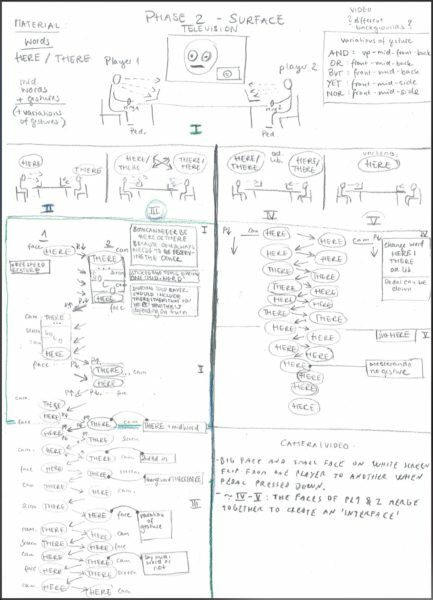 Will the players succeed to keep the rules intact or will they become entangled in a scattered state forever? 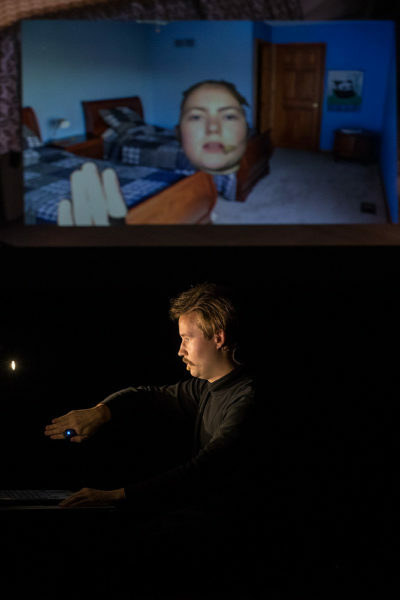 Act-101 together with media artist Ville Niemi present a new play HEAD GAMES for two performers, involving gesture controlled sensors and real-time video processing. The piece will be premiered 30.11.2018 in The Helsinki Music Centre as part of the MuTeFest –festival. The two players of the game (members of Act-101) are sitting and facing each other at a table with their laptops. 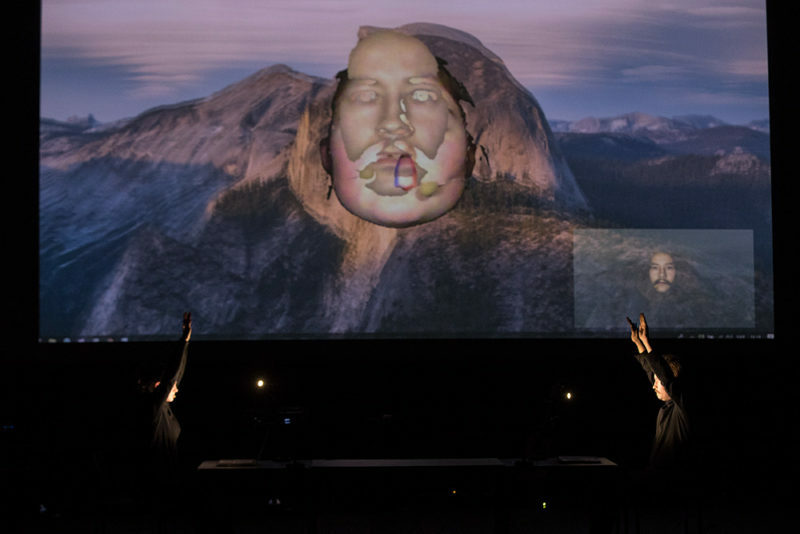 The actions made by the two performers are based around different kind of choreographed gestures with the hands that are read by motion-sensing rings worn by the two performers. 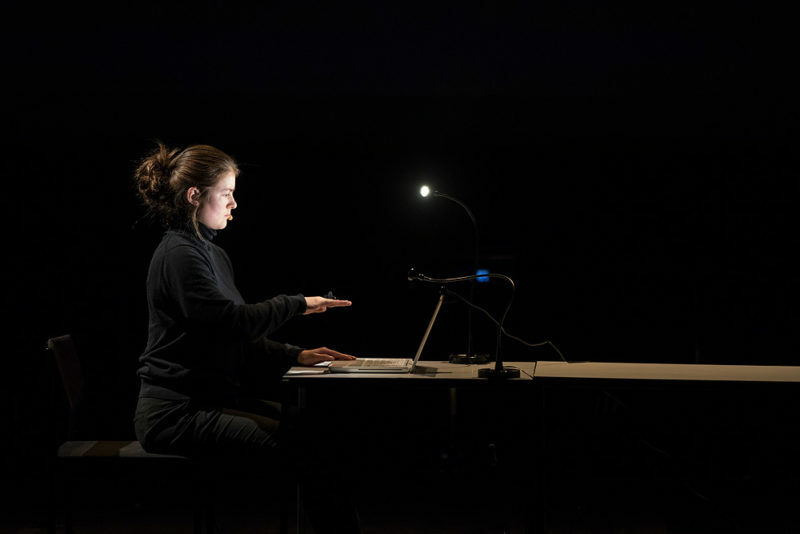 These gesture controlling sensors work as wireless MIDI controllers that translate the different gestures and positions of the hand to preprogrammed sounds and effects in order to create sonic equivalents to the movements seen on stage. Behind the table of the performers is a screen on which the faces of the performers are being projected realtime by web cameras. 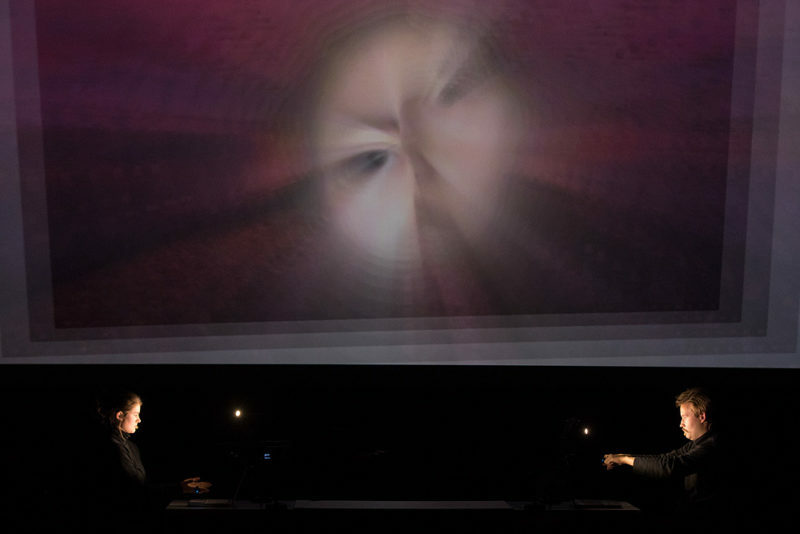 The spectator can follow from the screen the dialogue between the two performers but also how they eventually dive into the video interface. The MIDI signal originating from the gesture-controlled sensors is shared to the video processing software. The performers are therefore able to control also the events on the screen with their gestures. 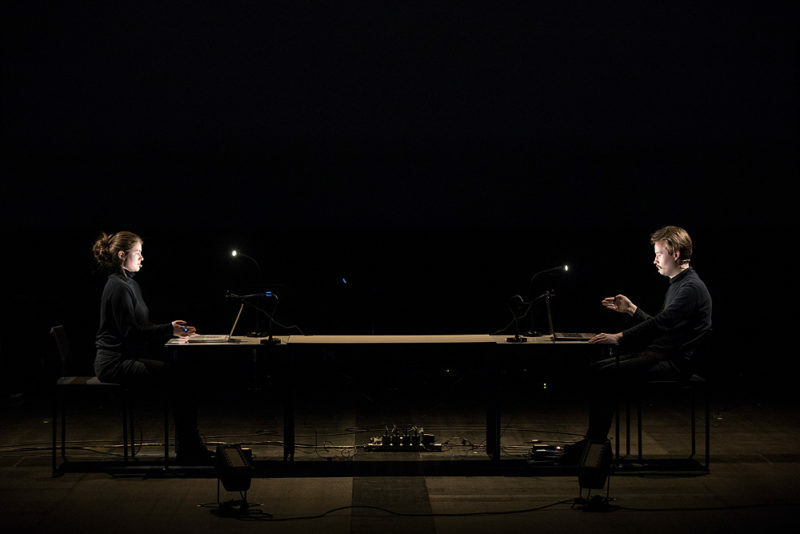 By staging two persons occupied with their laptops – although physically facing each other – the piece deals with how digital interfaces have started to dictate the ways we communicate and interact with each other. The choreographed gestures work as an interface to the game and its rules, but also to the digital soundscape and imagery of the performance. 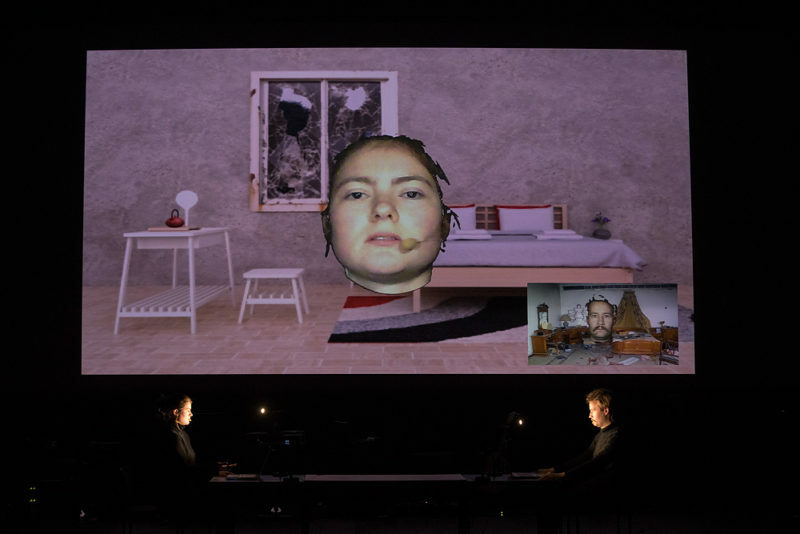 Ultimately the scene of the performance presents a paradox: by the aid of telepresence constituted by different interfaces, we are simultaneously there and not there. Meno: generatiivinen, interaktiivinen, kokeellinen, luova, media art, media artist, mediataide. Teemat: digitaalisuus, ihminen ja kone, käyttöliittymä, kyborgismi, virtuaalitodellisuus.